It never leaves your side. Your whole life is contained in its circuits. You researched its purchase more thoroughly than anything you've bought apart from your house or car. But how much do you actually know about your smartphone? From graphite in the battery to the silicon of the processor, there are dozens of of metals, minerals and compounds inside every phone. Some of them are only present in tiny quantities (for example, the very thin layer of indium tin oxide that makes your screen work as a touchscreen) but all of them have to be extracted from the Earth before being assembled into your handset. The mining and manufacturing processes have very real environmental consequences. As our appetite for new mobiles grows, so too does the impact on the world and its occupants. And these are finite resources, meaning that the more we want, the less we have. So what exactly goes into a smartphone, and how do we get it? How much of it is left, and what happens when we run out? Building up a definitive list of every material inside your smartphone is difficult due to tightly protected trade secrets and variations between makes, models and manufacturers, but it's possible to build up a general picture. According to the Minerals Education Coalition, a baby born in the US today will use up 539 lbs of zinc, 903 lbs of lead and 985 lbs of copper during his or her lifetime, not just in phones but in other gadgets and appliances too. In terms of environmental drain from every smartphone that's made, you can add the oil used to produce plastics, the sand used to produce glass, and so on. Of the 83 stable and non-radioactive elements in the periodic table, at least 70 can be found in smartphones. According to the best available figures, a total of 62 different types of metals go into the average mobile handset, with what are known as the rare Earth metals playing a particularly important role. Of the 17 rare Earth metals, 16 are included in phones. Neodymium, terbium and dysprosium, for example, are three of the rare Earth metals: they give your phone the power to vibrate, so smartphones could be made without them – but you'd have to rely on your ringtone. Terbium and dysprosium are also used in tiny quantities in touchscreens to produce the colours of a phone display. In this case, "rare" doesn't necessarily mean in short supply, but they aren't plentiful either – they're spread out in small reserves in many different places on the planet, and extracting them can be tricky and time-consuming. And once they've been extracted, that's it: we only have a finite amount of them, and there are no adequate replacements. Phones are getting faster and bigger, but at what cost? In 2013, academics at Yale University looked at the 62 metals and metalloids inside smartphones, and rated their possible replacements: not a single replacement was "just as good" and 12 had pretty much no effective replacement at all. "We all like our gadgets; we all like our smartphones," said study co-author Barbara Reck at the time. "But in 20 or 30 years, will we still have access to all the elements necessary to provide the particular functions that make a smartphone so great? Based on our findings, it is unlikely that substitution alone can solve potential supply restrictions for any of the metals on the periodic table." Smartphone production as we know it isn't about to grind to a halt for a few decades yet, but the Yale findings are a shot across the bows of the industry. Improvements are needed in opening up new resources, recycling existing materials and researching alternatives if we're to avoid a return to low-tech handsets without the features we've come to rely on. Dysprosium reserves, for example, might last as long as 2050 – but it's also possible that they'll run out by 2020. And if they do, then the 2019 iPhone might have to last you longer than you think. A whole host of factors need to be taken into account when making these predictions – prices, demand, mining technologies, new reserves – but some of the estimates are alarming: we could be low on copper by 2050 and low on gold even earlier. "One can anticipate increased pressure on metal supplies over the next few decades," says Professor Thomas Graedel of Yale, one of the academics looking closely at metal production and future approaches to the way we use it as a society. "Criticality constraints are thus multifaceted, and evolving." In other words, supplies of smartphone materials depend not only on how much of the stuff is buried in the Earth, but also on how great the demand for it is and the technology available to extract it – and those factors are changing constantly. That's why you can read about a metal being in short supply one year and abundantly available the next. As Graedel puts it: "Corporations, national governments, and resource sustainability experts have different goals, different perspectives, and different time scales." This means no one has a definitive answer on how long our reserves of these materials are going to last – but most agree we need to be doing something about it. Some metals, like iron and aluminium, are available in such large quantities that there's no squeeze on their availability. For others, the problem is potentially more acute – copper is among the three most-used metals in the world, essential for smartphones, desktop computers, industrial machinery, green energy initiatives and much more. Unfortunately, copper isn't being discovered fast enough to keep up with demand. The lead time for a new copper mine stands at around 20 years due to the difficulty of exploring new sites, fluctuations in the price (and therefore commercial viability) of mining the metal, various regulatory restrictions from local governments, and several other factors. 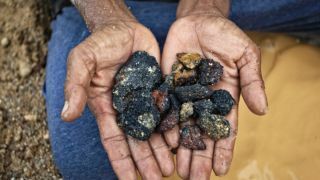 The quality of copper extracted from some of the major mines in the world is falling off rapidly, and it may be some time before the price rises high enough for other mines to be commercially viable – for the last year the copper price has been fairly flat as it bubbles under the $3 per pound mark, but experts estimate it needs to get up to $3.50 before there's enough financial incentive to create new mines (and it's difficult to predict when this will be). Current page: What's inside your handset?